But the Knockrow fortress could soon become a hot spot for a completely different reason. In the corner car park resides a 180-panel solar grid sitting atop a newly constructed car port, generating enough electricity for the castle and its surrounding grounds. According to the castle’s owner, the abstract structure represents the beginning of an electric revolution. However, Tesla is adopting a “build it and they will come” mentality to electric cars in Australia and feels it will soon have the right formula and model mix to help the technology gain traction. “It is real and it’s here,” Tesla spokesman Heath Walker said. 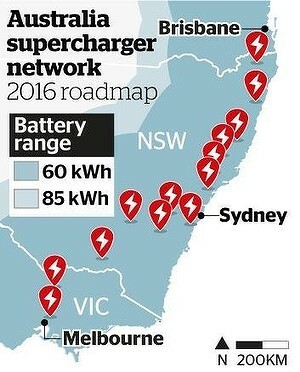 “We’re taking a two-pronged attack in Australia: our supercharger network and also new hotel partnerships where we’re putting high powered wall units in different hotels – both single and three phase.” The Darling Hotel in Sydney and the Marriot in Melbourne are already up and running. “Charging at home has been another perceived barrier, but now we provide a unit that provides 40 amps of power and hooks up to the house. You can charge overnight and have up to 500km of range the next morning,” he said. At the lower end of the market, a Nissan Leaf costs $39,990 (plus on-road costs) and has a range of up to 170km – something previously at odds with Australia’s sparse layout. But Mr Gilding, who lists Tesla founder Elon Musk as “a hero”, believes creating more incentives to own an electric car, such as free charging, would spur along demand. “I’ve been following Tesla since the beginning, the forward thinking that Musk has shown in the design of those cars, the range, is pretty cool,” said Gilding, whose car charging station required an outlay of $140,000 and is currently free for public use.